Paleo Food List > Is Spirulina Paleo? 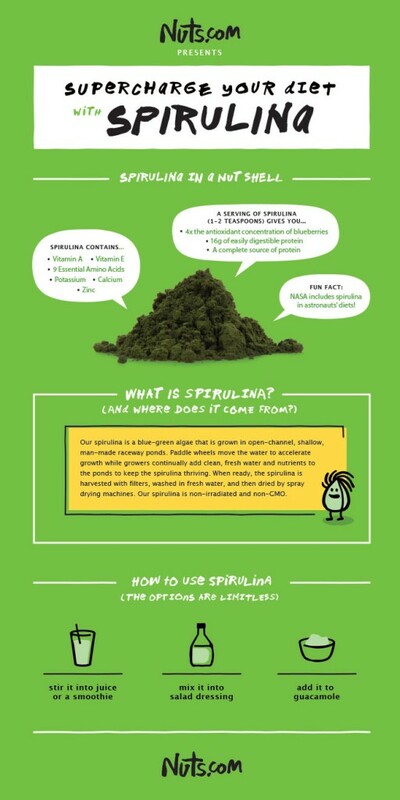 Spirulina is a type of seaweed that grows in lakes in subtropical regions like Africa, Asia, and Latin America. In those areas, it has long been prized as a highly nutritious food, and anything that has been highly regarded by ancient cultures deserves our attention. Technically, spirulina is a vegetable, and you should always eat your vegetables. It’s an aqueous vegetable, rather than a terrestrial vegetable, but that doesn’t diminish its nutritional value. On the contrary, spirulina is one of the most nutritious plants around. It contains all of the amino acids, which makes it a good plant source of protein (although why you would choose to avoid good old fashioned meat or eggs is beyond me). Spirulina is also rich in a number of vitamins, minerals, and fats, including a rare form of omega-6 that (unlike most omega-6 fats) contains anti-inflammatory properties. It’s also loaded with antioxidants, which play their own part in lowering inflammation and boosting the immune system. Depending on where you live, you might be able to find fresh spirulina, in which case you can feel free to add it to your salad, soup, or stir-fry. For the rest of us, it’s usually available in pill form to take as a supplement. If you choose to go that route, it’s certainly paleo-friendly, but it shouldn’t be necessary as long as you’re eating a nutritious diet full of a variety of other vegetables. Nuts.com is one source where you can purchase spirulina online. They’ve also created the infographic below to help point out a few different interesting details about how you can use it. Mark Sisson gave his take on spirulina in this post.